The only nuclear reactor under construction in the U.S. is already years behind schedule and billions of dollars over budget. Now, public officials in Georgia are about to decide if it’s worth even finishing the project. On Thursday, the state’s five-member Public Service Commission (PSC) will vote on whether to approve the latest plan, which includes updated cost and timeline figures. Update: The plan was approved. More details below. There’s barely been any new nuclear power in the U.S. since 1979, when the Three Mile Island accident caused prices and regulations to soar. Earlier this year, a nuclear reactor was abandoned mid-build in South Carolina due to similar financial stresses as the Georgia plant, thus eliminating thousands of jobs and squandering billions of dollars. The embattled nuclear industry got some further bad news this week, when the GOP tax bill passed without extending a key nuclear power tax credit that the backers of the Georgia reactor were counting on, although it may get another shot in the new year. Georgia’s Plant Vogtle, which is being built by Georgia Power, a subsidiary of Southern Co., was supposed to be operational this year but is now isn’t slated for completion until 2021 or 2022. It’s also expected to cost over $23 billion, some 9 billion more than the original estimates in 2008. 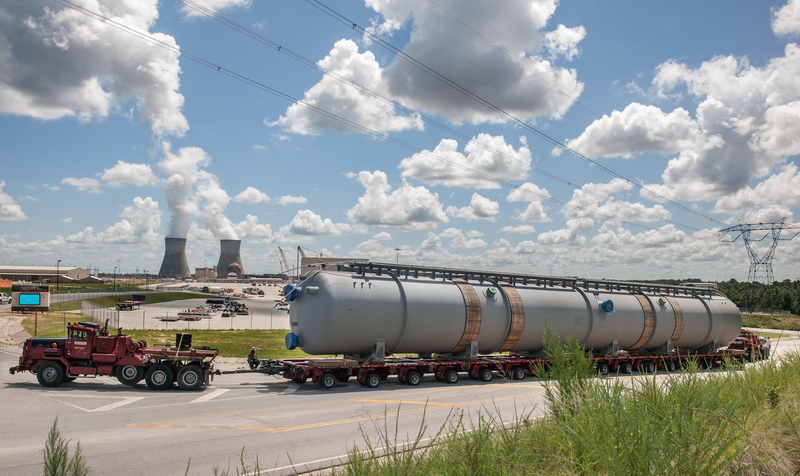 The project received $8.3 billion in loan guarantees from the Energy Department, and had qualified for roughly $800 million in production tax credits (PTCs) if the reactors started producing electricity by the end of 2020—which it’s now clear they will not. Nearly a fifth of the country’s electricity is generated by 99 nuclear power plants. They’re an average of about 36 years old and five reactors have gone offline in the last few years. The Georgia reactors are supposed to represent a new era of nuclear power, one that could carry on the legacy of the aging fleet and provide a critical clean energy source to help meet climate change targets. But the low cost of natural gas and increased market share of renewables have heightened the challenges of building a new nuclear plant. Many of the plants currently in operation are already losing money. A major issue with the Vogtle reactor is that cost overruns get passed on to ratepayers who will eventually use the electricity. Another issue is that if construction is aborted, some 5,000 jobs will be lost almost immediately. Not to mention the extreme headaches it will cause for the companies invested in the project, which along with Georgia Power include Oglethorpe Power Corp., Municipal Electric Authority of Georgia (MEAG), and Dalton Utilities. With a final decision on the plant’s future looming, earlier this month the PSC staff attacked Georgia Power for its role in the current quagmire. In a brief filed with the PSC, the staff asserts that Georgia Power is responsible for the bankruptcy of Westinghouse Electric Co., the company that was constructing the reactors, in March, and that customers should not be the ones who end up paying for those mistakes. Jill Kyser, a staff attorney in Atlanta with the Southern Environmental Law Center, told Earther that Georgia Power, which has a 45.7 percent share in Plant Vogtle, went to the PSC in August asking for a new price approval of $12.2 billion, nearly twice as much as originally requested. She said the commission could approve a lower number, like $9 billion, which would force Georgia Power to incur more of the risk rather than passing it onto ratepayers. Georgia Power customers have already paid the utility more than two billion dollars since 2011 towards the plant, an unusual circumstance since customers don’t usually pay for energy infrastructure until it’s actually producing energy. John C. Lee, a nuclear engineer at the University of Michigan, told Earther he thinks the construction process should go forward. Plant Vogtle is a new kind of nuclear reactor, the AP1000, without precedent in the world—although China is nearing completion on several. He said that while a few years and billions of dollars may seem like a lot, over the course of the plant’s 60 to 80 years of operational life that investment will easily pay off, especially if the natural gas faucet start to run dry, which it very well could in several decades. AP1000s are some of the world’s most advanced commercial reactors and are equipped with a state-of-the-art passive cooling system aimed to avoid accidents like those at Ukraine’s Chernobyl power plant and Japan’s Fukushima Daiichi. The water circulation pumps employed by the reactors, which work to cool the reactors in case of a potential meltdown, are challenging to build, and according to Lee, the U.S. has never manufactured these pumps before and had to go through several versions. The same was true in China. Lee blamed the current boondoggle on the dismal state of large infrastructure projects across the country, not just nuclear plants, and not on the companies behind the Vogtle plant. Lee said the Georgia reactors hold a lot of hope for the entire nuclear industry, and if the plant is completed, other utility companies will follow suit and order plants. Lee even has hope for the abandoned reactors in South Carolina being brought back into construction by a new consortium of investors. If regulators decide the project can go forward, they are expected to set new conditions, leaving it up to up to Georgia Power to make the final call.